I think most of my friends on Facebook and Twitter may have already seen this but I thought I should share it here too. I recently had a social media friend — Aimee Whetstine of Everyday Epistle — ask me if I was willing to do an interview with her and if I thought other women at my office — aka Monsanto women — would be willing to do it too. Yesterday, BlogHer (a site that averages 55 million unique visitors monthly) posted the article that Aimee did based on a variety of research and those interviews. I wanted to be sure folks who follow the blog saw it. Here’s the start of the article… you can click on the header or the link at the end to read it in full (and you really should if for no other reason you can see some of the awesome women I work with. And a few minutes ago when I logged on to respond to any comments there may be I realized the post is the most popular one on BlogHer…. that makes me say wow. Monsanto recently made the headlines when the Supreme Court unanimously ruled to uphold the company’s patent on its genetically modified seed. This technology is in high demand by farmers, but it also makes Monsanto a lightning rod for controversy. I wondered: What’s it like for the women who work at this Fortune 500 Company? What would they want other women to know? 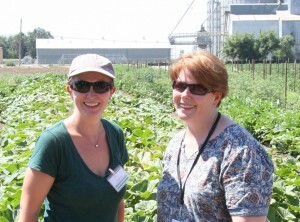 Janice Person, social media director for Monsanto (R), with blogger Megan Brown in one of Monsanto’s research plots. Image credit: Janice Person. Some background: Monsanto is one of the world’s largest agriculture companies. It sells seed and chemicals to farmers and licenses technology to other biotech firms. Biotech seed is genetically engineered to produce certain traits in plants — for example, Monsanto’s popular Roundup Ready seed produces plants that are tolerant of glyphosate, a herbicide considered less toxic to the environment than other pesticides. Glyphosate kills weeds without harming plants that have the trait. Farmers who plant the biotech seed may not have to treat their fields as often or with additional herbicides. Controlling weeds is important to farmers because weeds decrease crop yields and quality by competing for resources like water, sunlight, and soil nutrients. Similarly, Monsanto has genetically engineered seed to grow plants that produce Bt (Bacillus thuringiensis), a naturally occurring soil bacterium that’s sprayed by some organic farmers as a pesticide. Bt is toxic to worms that eat farmers’ crops, but harmless to fish, birds, people, and other vertebrates. Critics of Monsanto voice a number of concerns. Some say the company forces farmers to use their seed, although farmers like Brian Scott disagree with this assertion. Other critics worry that organic crops could be contaminated and organic farmers sued for patent infringement if pollen from Monsanto’s biotech crops drift into their fields. However, last year a New York federal judge dismissed a case brought by some organic farmers, ruling they “overstated the magnitude of [Monsanto’s] patent enforcement.” Others say GMOs (genetically modified organisms) cause health problems, but groups like the World Health Organization report that biotech foods on the market today have been thoroughly tested and are unlikely to present human health risks. Other critics say Monsanto’s technology breeds superweeds, causes cotton farmers in India to commit suicide, and infiltrates organic maize in Mexico. The list goes on and on. 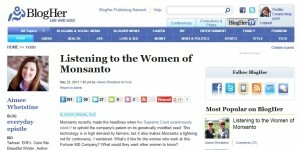 via Listening to the Women of Monsanto | BlogHer. G is for GMOs – What are GMOs & Why Do Farmers Plant GMO Crops?